In a medium saucepan, cover the farro with 2 inches of water. Bring to a boil, cover and simmer over moderately low heat until tender, about 25 minutes. Drain and let cool for about 10 minutes. In a large bowl, whisk the oil with the garlic and lemon zest and juice. Add the cooled farro and toss well. Add the fennel and parsley and season with salt and pepper. Just before serving, fold in the arugula. 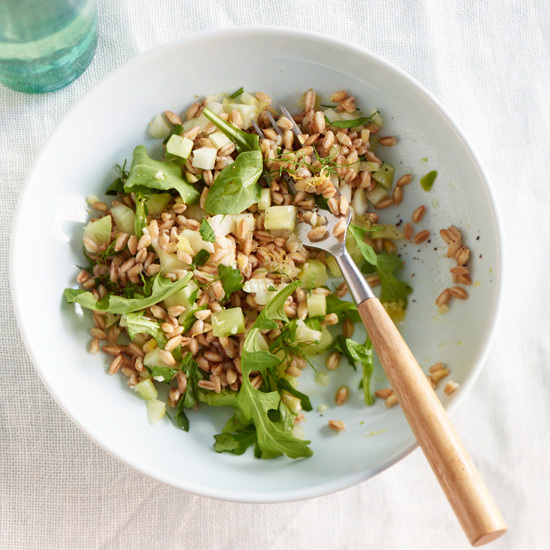 The farro salad can be refrigerated overnight and served lightly chilled or at room temperature. Fold in the arugula just before serving. One Serving: 243 cal, 31 gm carb, 12 gm fat, 1 gm sat fat, 6 gm protein, 6 gm fiber.